Suzuki, scared by the rising costs of its V4, pulled out of 250 GP racing in 1965, and the fabulous Honda 250-6 lived up to its promise. Yamaha - flushed with the titles won in 1964 and 1965 by Phil Read with the RD56 twin - in turn leapt ahead technologically. 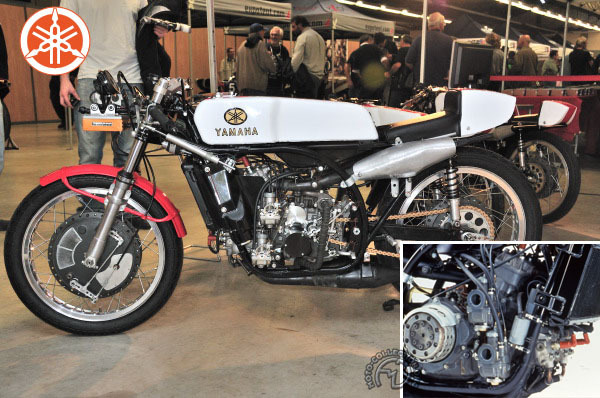 High and heavy, the first Yamaha RD 05- an air-cooled V4 - was tested in 1965 at Monza by Phil Read. Horrendously complicated, the V4, mounted in a similar frame to that of the RD 56, consisted of two twin-cylinder engines - one mounted horizontally and the other inclined at 10-degrees from the vertical - with their cranks coupled by gearing. The engine drank from quadruple carburetors via rotary intake valves. Seven- or eight-speed transmissions were used according to circuit. Though mechanically fragile, the RD 05 developed a promising 50 hp at 14,000 rpm. Later, Read tested a water-cooled version, the RD 05-A. Further modifications produced the RD 06, with the angle between the cylinders cut to 70 degrees. Its weight was trimmed to 326 lb and its power increased to 65 hp at 14,000 rpm. Electronic ignition supplanted the coil and- battery. Nevertheless, neither Phil Head nor I3ill Ivy could make any headway against Hailwood's Honda 6, which won ten Grands Prix out of 12 in 1966. In 1967, Read only made runner-up in the Championship behind Hailwood. Honda retired in 1968, leaving the field open to the RD 06A. Bill Ivy's Yamaha lapped the Isle of Man TT circuit at a record 105.5 mph and Read took the world title. The fast and complex RD06-A finally proved too much for the governing body of motorcycle sport, which after 1968 restricted racing 250s to two cylinders and six-speed transmissions.